But the man responsible for it - former England, Leicester and Stoke goalkeeper Gordon Banks who has died at the age of 81 - was typically modest and self-deprecating when recalling how he defied Pele, and seemingly gravity itself, during an iconic World Cup moment. Pele was at the height of his powers when Carlos Alberto's mesmerising team faced defending champions England in the sweltering heat of Guadalajara during the group stages of the 1970 World Cup. The contest, viewed at the time as the final which might have been, was edged by Jairzinho's goal on the hour. "When we had training sessions (in Mexico), I noticed that when the ball was dropping in front of me, it was kicking up, not staying low like it did in England," Banks said in an interview on the Football Writers' Association website in January 2018. "I stopped back to do some extra shooting training to help me get used to it, and that helped me make the save. Pele was around the penalty spot when the guy crossed it from the wing, and I knew he was going to get up to it, because he could jump really high. "I knew that I had to come off the line to narrow the angle, then once Pele had punched it with his head down to my right-hand side, I knew I had to get over there very quickly. "The ball was going in and as I dived I had to anticipate how high it was going to come up from the hard surface. As I reached across, I got it right, the ball hit the top of my hand and went off... but honestly, I thought it was a goal. "I hit the floor and turned around, I saw the ball bounce behind the goal - and I thought to myself, 'oh, Banksy, you lucky t***'." Immediately after, Banks claimed, Pele said: "I thought that was a goal." Banks replied "You and me both" before captain Bobby Moore joked: "You're getting old, Banksy, you used to hold on to them." But the 1966 World Cup winner would always share a joke with his old friend over his part in Pele's unique World Cup story. "Whenever I saw him, he said: 'Gordon, I travel all over the world and people talk about the goals I scored, but when I come to England, all they talk about is that save that you made against me," Banks said. "From the moment I headed it, I was sure it had gone in," he said. "After I headed the ball, I had already began to jump to celebrate the goal. Then I looked back and I couldn't believe it hadn't gone in. I have scored more than a thousand goals in my life, and the thing people always talk to me about is the one I didn't score," he said. Writing on Instagram today, the man often acclaimed as the greatest ever to play the game paid tribute to his late friend. 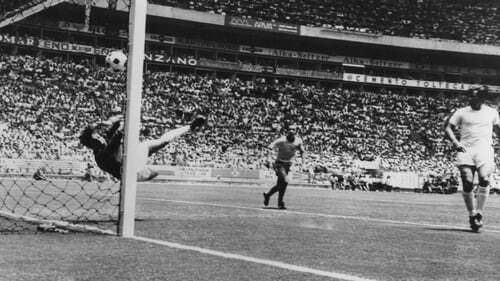 "For many people, their memory of Gordon Banks is defined by the save he made against me in 1970," said Pele. "I understand why. The save was one of the best I have ever seen - in real life and in all the thousands of games I have watched since. "When you are a footballer, you know straight away how well you have hit the ball. I hit that header exactly as I had hoped. Exactly where I wanted it to go. And I was ready to celebrate.But then this man, Banks, appeared in my sight, like a kind of blue phantom, is how I described him. He came from nowhere and he did something I didn't feel was possible. He pushed my header, somehow, up and over. And I couldn't believe what I saw. "Even now when I watch it l, I can't believe it. I can't believe how he moved so far, so fast. I scored so many goals in my life, but many people, when they meet me, always ask me about that save. While it was indeed phenomenal, my memory of Gordon is not defined by that - it is defined by his friendship. "He was a kind and warm man who gave so much to people.So I am glad he saved my header - because that act was the start of a friendship between us that I will always treasure. "Whenever we met, it was always like we had never been apart.I have great sadness in my heart today and I send condolences to the family he was so proud of. Rest in peace, my friend. Yes, you were a goalkeeper with magic. But you were also so much more. You were a fine human being." "He was a superb player, something special," Banks said. "I played against some great players, and he was the best player I ever played against. "He just seemed to know everything about the game and brought in these new things which he had done himself, so all of that shows you just what skills he had got."